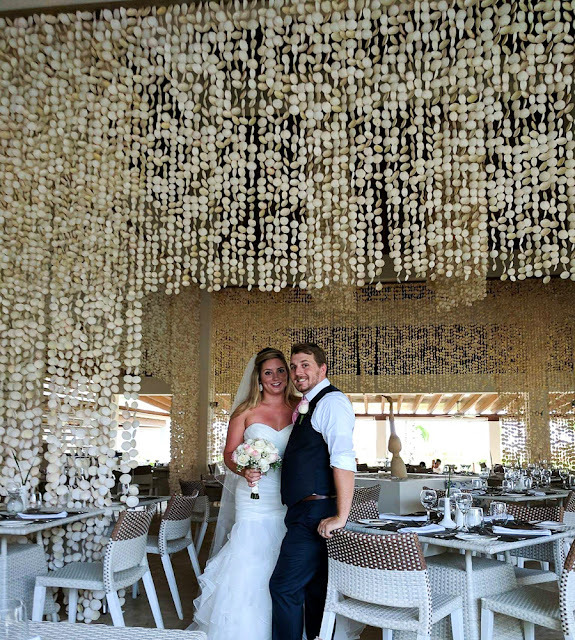 Planning any wedding can be overwhelming, especially one to a place you'e never even visited! Below I've listed a few things I learned along the way! Thank you so much to everyone who made it down! Our wedding week was so special and we love you all so much! #1: it's going to be a small wedding, and that's ok! 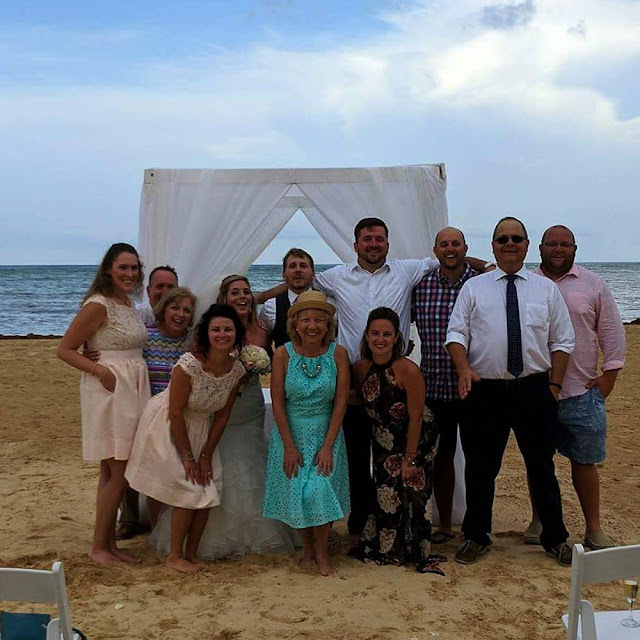 The idea of a destination wedding with all your friends and family is such a fun one! All the time in the sun, hanging out and catching up with your loved ones only to end the week with a giant party and gorgeous dress! Can it get any better? Yes and no: The reality is, getting everyone that you love for a whole week just isn't going to happen. We ended up with 12 - including us. At first, we were a little disheartened about not having everyone there, but it worked out for the best. Everyone got along so well and I couldn't have asked for a better vacation! Also, let me tell you, trying to evenly split your time with everyone who traveled so far to see you and making dinner decisions and lunch decisions and trying to keep everyone happy is work, but worth it!! This is me cheesing so hard with Carmen, our wedding planner. 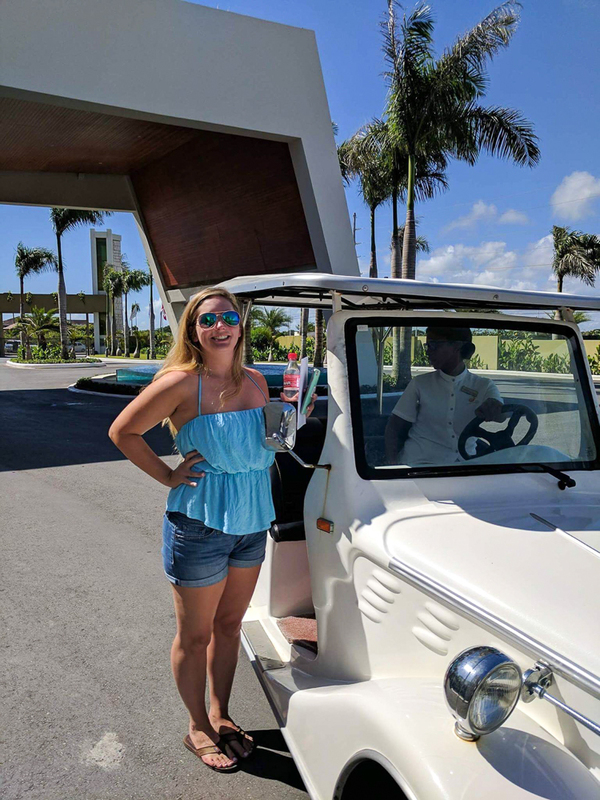 This fancy golf cart was so fun to ride in! 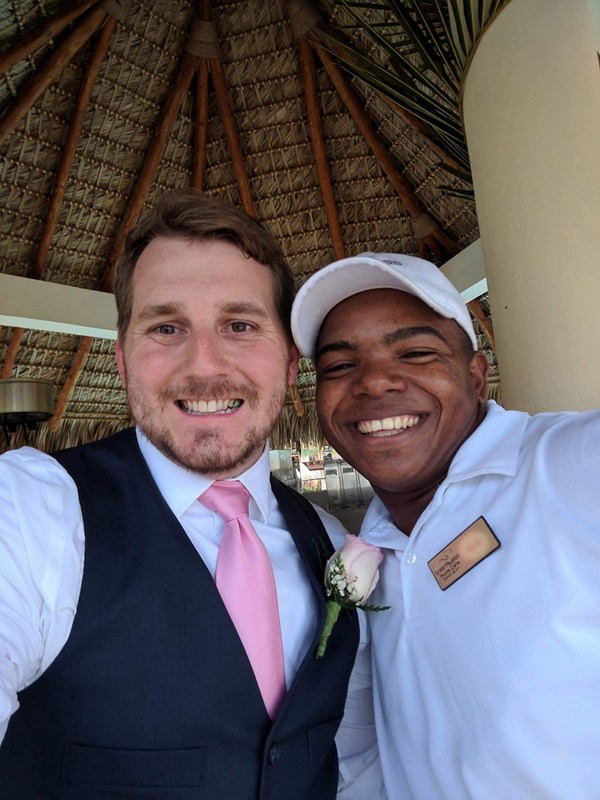 I also got to hop in on my way down to the ceremony! #2: The resort wedding planners have this down to a science, trust them!! Our wedding planner, Carmen, was amazing! We met with her the morning after we arrived at the resort and she walked us through everything and made sure we had exactly what we had always dreamed of. She had the perfect combination of business and warmth and she actually ended up performing our wedding ceremony! 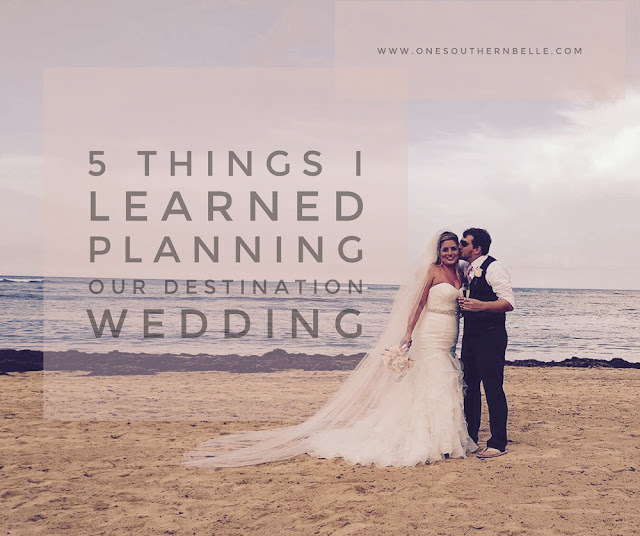 I went into our destination wedding trusting the process and the planners and I had literally no stress! *except fitting into my dress! 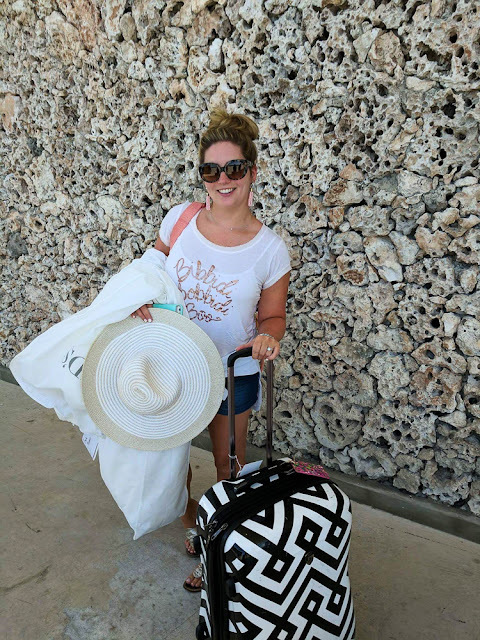 #3: Traveling with a wedding dress is fun, but not easy! I can only imagine that walking through an airport with a giant wedding dress is similar to going anywhere 9 months pregnant. It felt like everyone had to ask if we were flying off to get married! Which, of course, we were, and we were super excited to be doing so but it can get exhausting having the same conversation 100 times before 6am, but nice to have complete strangers strike up a chat! Also, just go ahead and be prepared to stuff your gorgeous dream wedding gown into the overhead compartment. I called the airline 6 months prior and even asked again the morning of and was assured that they would hang my gown in the coat closet only to be told upon boarding the plane that there was no coat closet and it would have to be stored overhead. I was not a happy camper! Luckily our wedding package included having my gown steamed and all was well in the world again! Any time you are planning an outdoor wedding you know that potentially you have to deal with the elements! The morning of our wedding we were hanging out in the pool when the bottom dropped out of the sky! We got lucky and it quickly passed but I did my best to relax and wait it out because getting upset is going to do nothing but ruin your day! Another element we didn't think about was the heat!!! 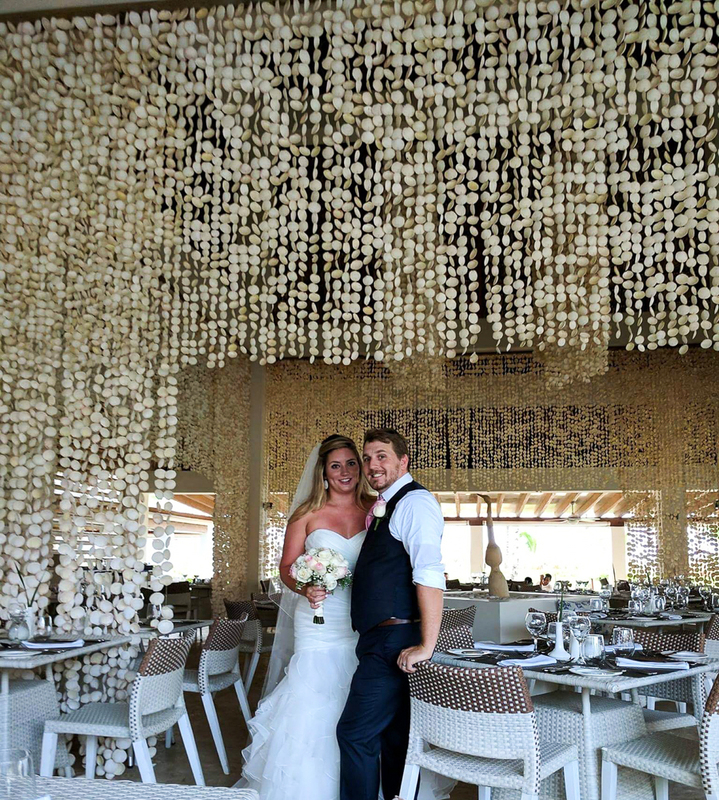 I originally planned on having dinner after the wedding at this gorgeous restaurant with curtains of seashells that blow in the wind. I didn't care what the food was I just wanted to be there for the atmosphere and photo ops! Here's where the flexible part came in- it was so hot we couldn't stand to be outside in our wedding clothes any longer. So last second we decided to head back to our favorite French restaurant for some air conditioning and yummy food! We still got to take some photos in the beautiful restaurant and we got to cool off! win/win!! #5: ( a tip form the Groom) Take care of those taking care of you! We went to an all inclusive resort where tipping is included (it's even all over their website) but taking the time to tip and thank the staff goes a long way. It doesn't have to be a huge amount but when they are happy they make sure you are extra happy! We even had a cabana comped for us on the day of our wedding! Side note: having a cabana for a day is really fun and totally worth the extra cost! The guys were able to watch TV while hanging out at the pool and the day of extra special pampering was a great touch!